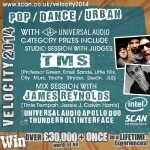 VELOCITY 2014: Just 5 more weeks to go…. 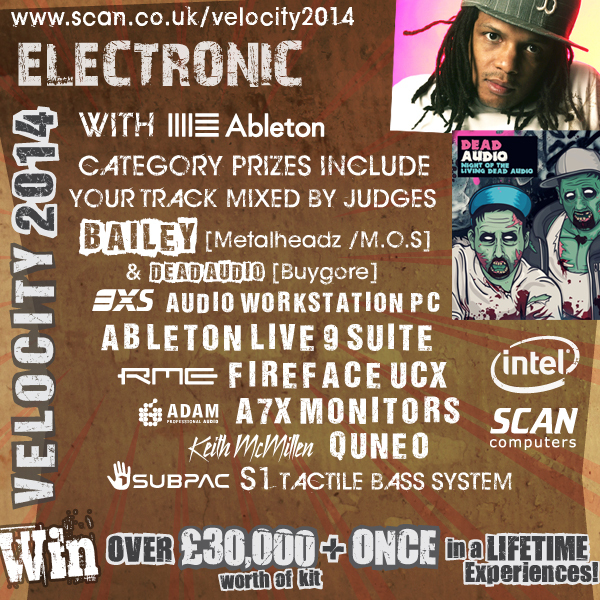 For those of you who haven’t been keeping track of the Velocity 2014 competition here at Scan, let’s just say it’s going great guns! And why wouldn’t it, with some of the best “Money Can’t Buy” prizes available, and the competition having 5 different categories in which to enter. 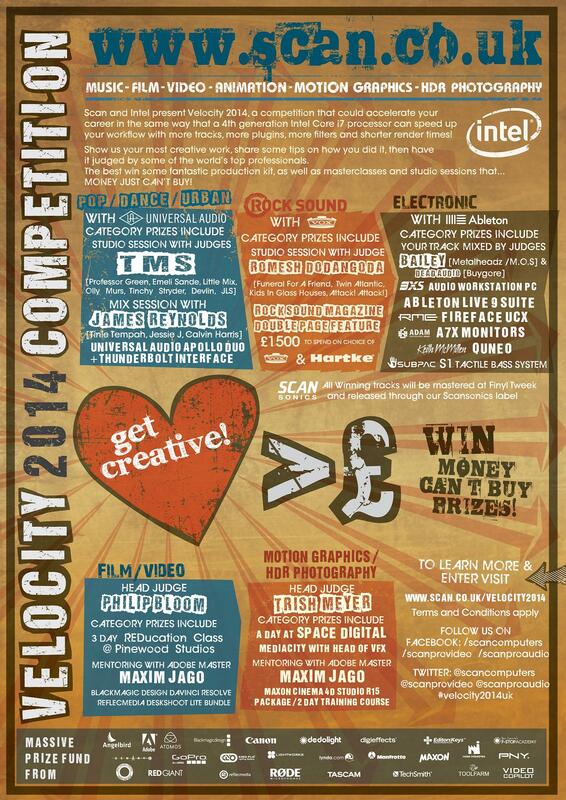 Together with our Platinum Partner Intel, Scan Computers are celebrating the launch of a major new competition for UK Creatives. 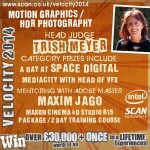 Velocity 2014 offers a career boost to digital creatives working at any level, with incredible prizes, over £35K of kit, plus the opportunity to get your work seen by industry pros such as Trish Meyer and Philip Bloom. 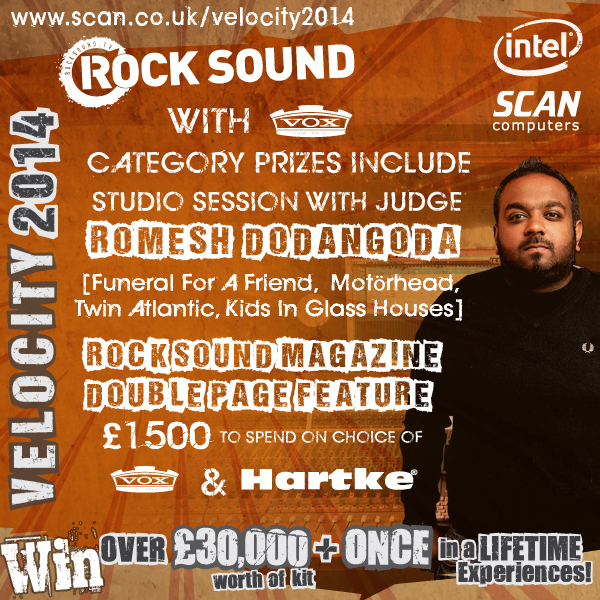 Velocity 2014 can accelerate your career in the same way that a 4th generation Intel Core i7 processor can speed up your workflow. Regardless of Operating System, when it comes to content creation, Intel processors are the professionals’ weapon of choice. TMS – The team behind number one singles such as “Read All About It” for Professor Green & Emeli Sandé, “Wings” & “DNA” for Little Mix and “No Regrets” for Dappy. You can submit a link to an original Short Film, Music Track, Music Video, Motion Graphics Ident, HDR Photo, or VFX showreel, and the finest will be shortlisted for judging this summer. We can accept a new or existing piece of work, as long as you own the rights to it. 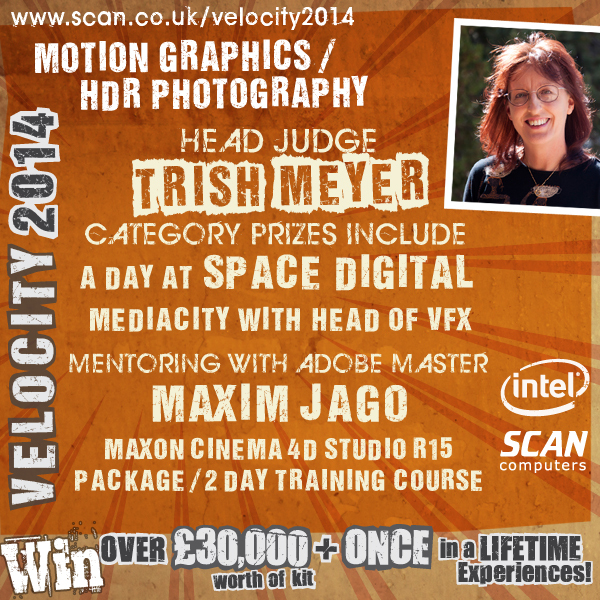 Whatever your status in the industry, the Scan team want to level the playing field. You can submit an additional Tutorial Video, which demonstrates and explains how you made your entry or any other creative technique that you choose. 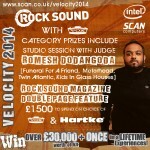 Prizes will be awarded for the most innovative ideas and instructive videos. This not only allows others to benefit from your tips, tricks & insights, but also gives you an extra chance of winning a prize. 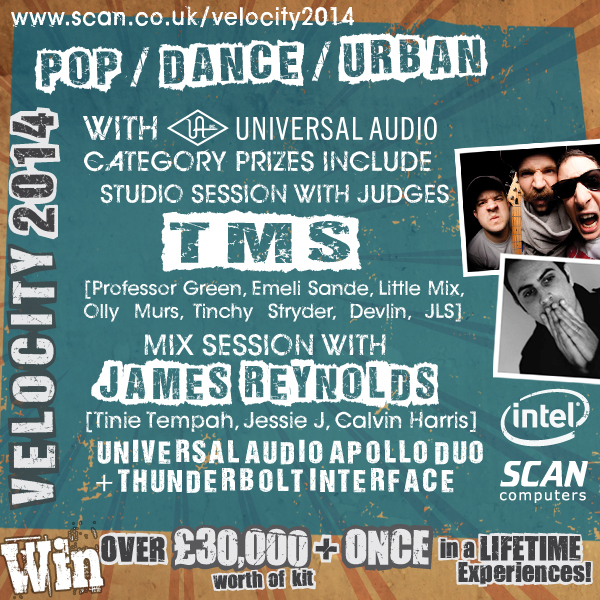 For more details visit SCAN Velocity 2014 and click on SIGN UP to receive key date alerts on the Masterclass series, industry speed-dating opportunities plus special offers from competition sponsors. And that’s not all. Whatever your status in the industry, the Scan team want to level the playing field. You can submit an additional iNside Story – a short How it’s Made style video – to demonstrate your innovation to the judges, allow others to benefit from your tips, tricks & insights and give yourself an extra chance of winning a prize. Don’t forget to join us on the socials @scanprovideo @scanproaudio @scancomputers & facebook/scanprovideo – we follow/Like back. Send your links to SoundCloud, Vimeo sizzle reels, trailers, kickstarters, events and screenings, and we’ll share the love. The deadline for submission is 31st of May, but don’t hang around. 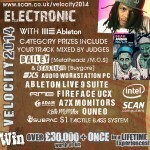 Join the Velocity 2014 Community online today. Bye Bye to the printed word……? 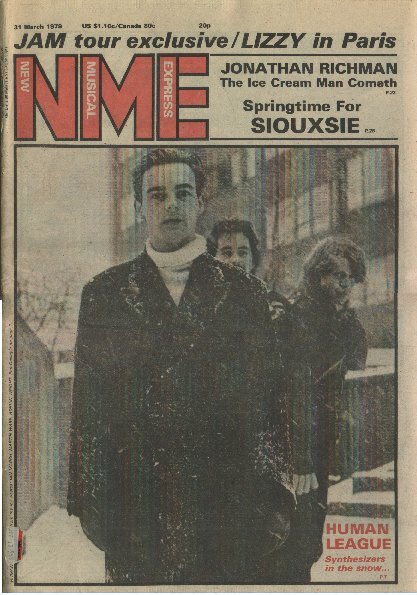 Back when I was a young musician, the only place you could ever really get in-depth information about your favourite bands or singers were magazines or weekly papers like the NME or Sounds. 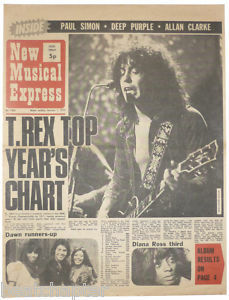 It’s difficult for younger readers to appreciate just how influential these papers were, sometimes in control of a bands destiny just by a review or an editorial. 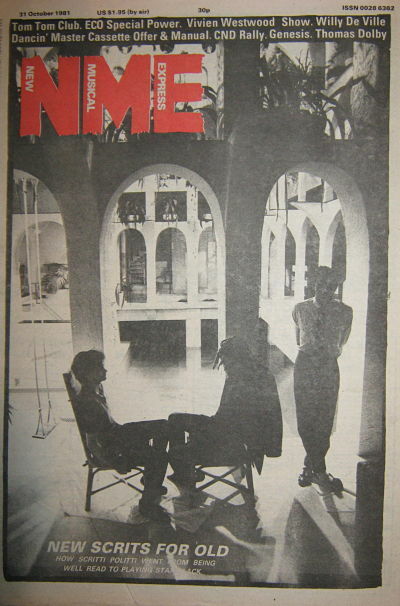 Last month the news came out, that NME, (which was one of the largest music Magazines in the UK), reported that their sales had dipped below 20,000 copies a month during the second half of 2013, whilst their website on the other hand, consistently receives around 1,4 million users a week. I don’t ever tire of seeing the world change around me, but when this sort of news comes out, it really hits home, is it really bye bye to the printed word? and yet, the truth is, that if its done well, people will happily still sit and read an article or a blog, albeit on a tablet or smartphone instead. So what of the journalists of the future? 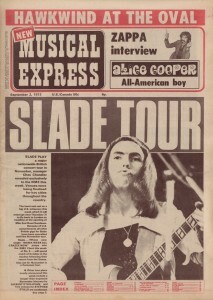 All in all, it’s a long way from this….